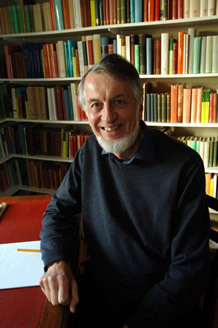 I came to Exeter as Professor of Classics in 1977, was Head of Department until 1990, retired in 2001, and am now Emeritus Professor. I'm still a regular participant in the Department's research seminar, and am always happy to be consulted informally about practically anything. I’ve been fascinated by the ancient world ever since I was a boy in the 1950s. My first and abiding interest has been in the late Roman Republic, both its literature and its social and political history: see Catullan Questions (1969), New Men in the Roman Senate (1971), Cinna the Poet (1974), Catullus and his World (1985), Roman Political Life (1985), and Remembering the Roman People (2009). That led me into the study of Roman historiography, and from there to the myth-history of early Rome: see Clio’s Cosmetics (1979), Historiography and Imagination (1994), Remus: A Roman Myth (1995), Roman Drama and Roman History (1998), The Myths of Rome (2004), which won the American Philological Association’s Goodwin Award of Merit, and Unwritten Rome (2008). But apart from these main areas, I’ve always been happy to chase up anything else that seems interesting: see for instance Roman Studies (1987), A Short History of the British School at Rome (1990), Death of an Emperor (1991) and Talking to Virgil (1992). One result of that habit was a little article for an American journal on J.K. Rowling and the ancient world, which gives (I believe) the only accurate account of what ancient authors Harry Potter’s creator encountered when she was a student at Exeter. Anne Wiseman, to whom I’ve been married since 1962, is also a classicist, and used to teach Latin in the Department. A long time ago we did a translation of Caesar’s Gallic War commentaries together (The Battle for Gaul, 1980), and now we’ve done one of Ovid’s Fasti (Times and Reasons, 2011). I can be contacted by the e-mail address above or by phone on +44 (0)1392 273226.